Aono Tsukune is so hard up on luck, that he can't even get admitted into high school. His parents finally find him a school with no tests required for admittance, out in the middle of nowhere. He finds out the school is a youkai (monster) academy, Just as he is about to resign himself and get back on the bus home, he bumps into a beautiful girl. Turns out this beautiful girl, Akashiya Moka, is also a vampire who bites him right off the bat. 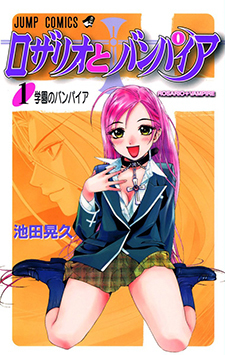 They become friends and Tsukune is ready for a happy school life with her, until he finds out that if a human is found on the school grounds, he or she should be killed. Now Tsukune must conceal his identity from the rest of the monsters at school, while at the same time being a ready snack for Moka when ever the urge takes her. What effect will this have on Tsukune and will Moka be able to keep him out of harm's way?